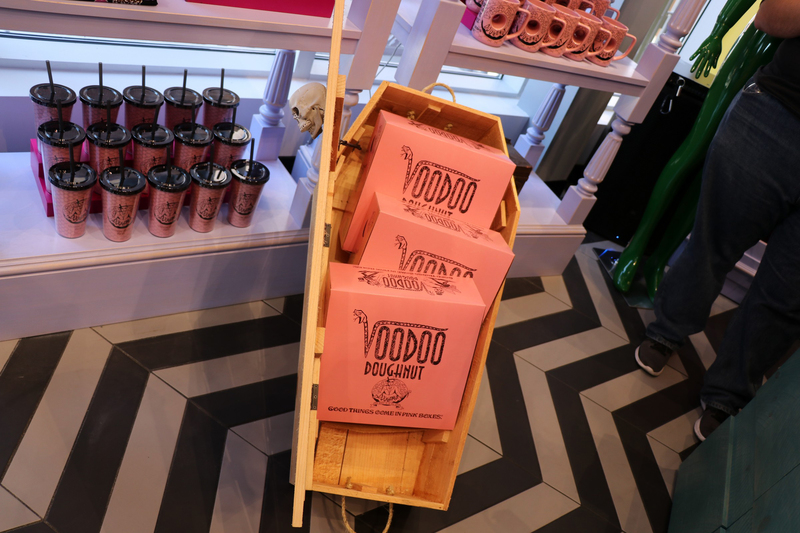 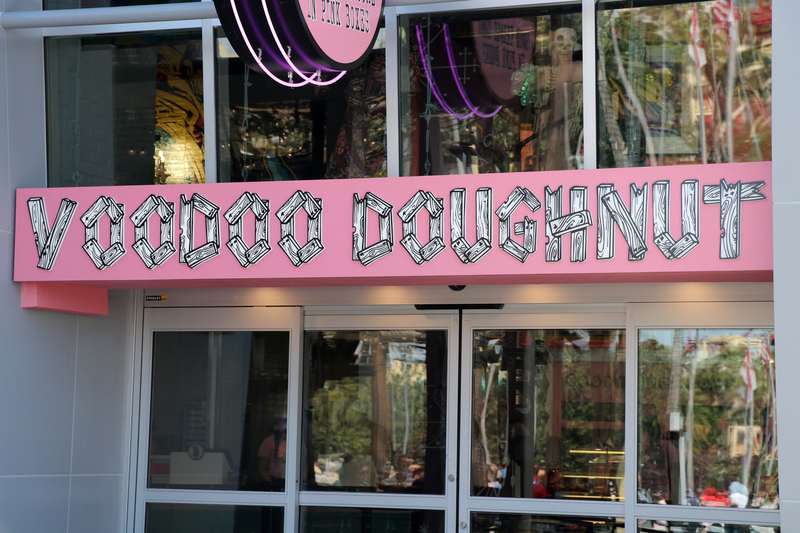 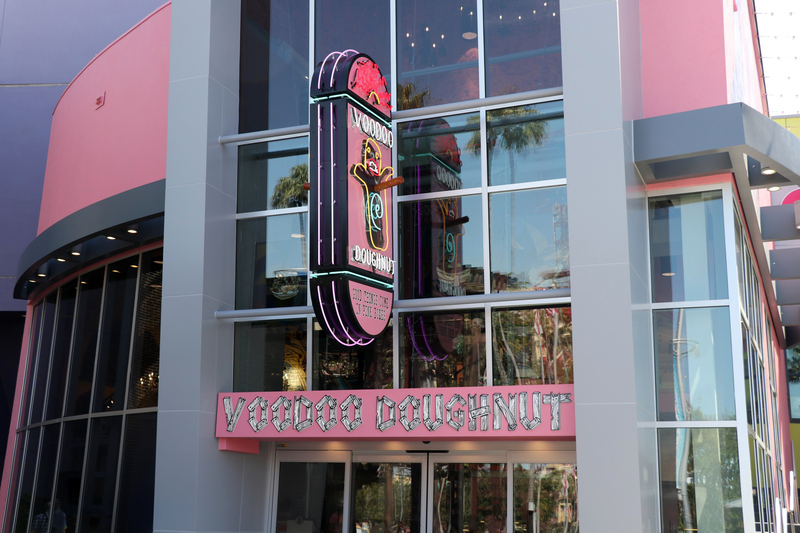 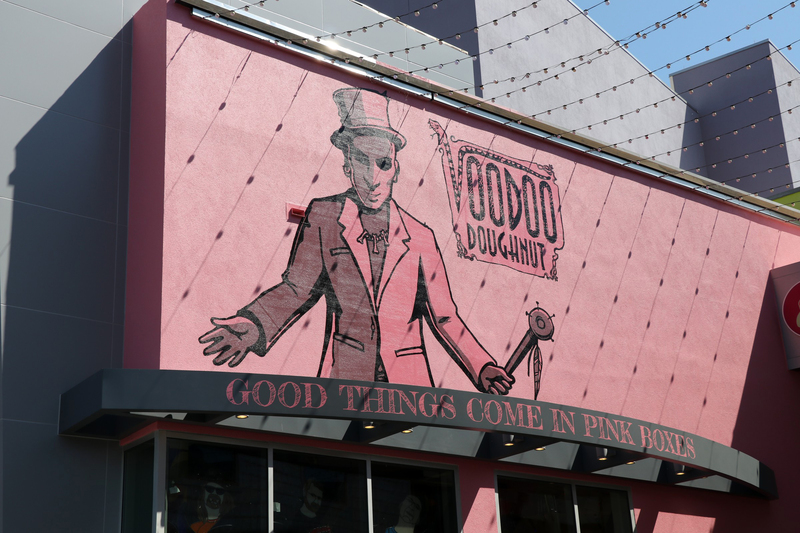 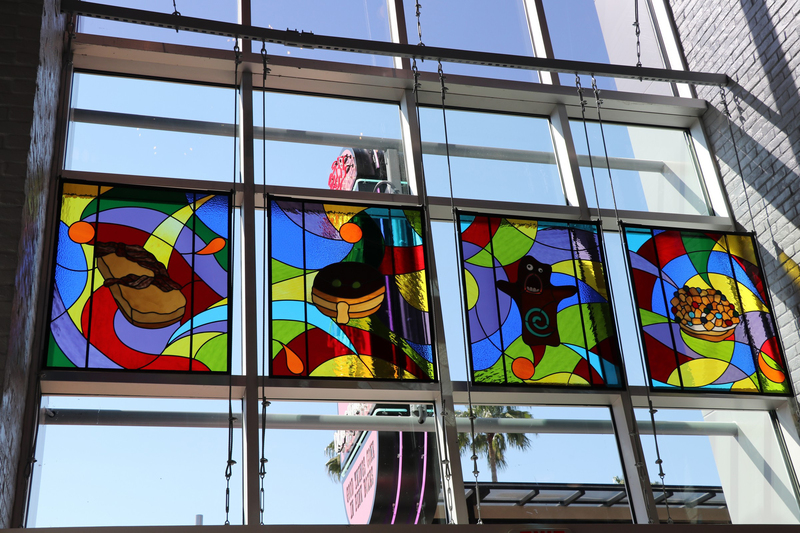 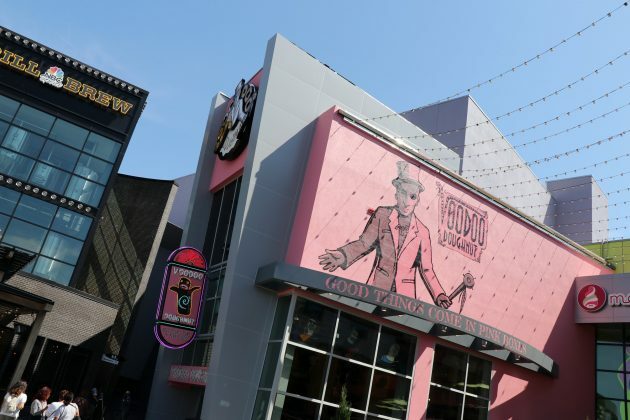 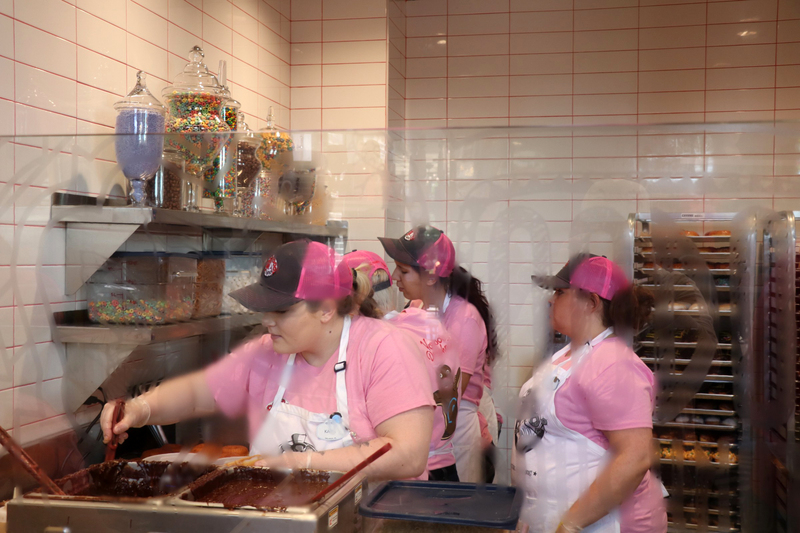 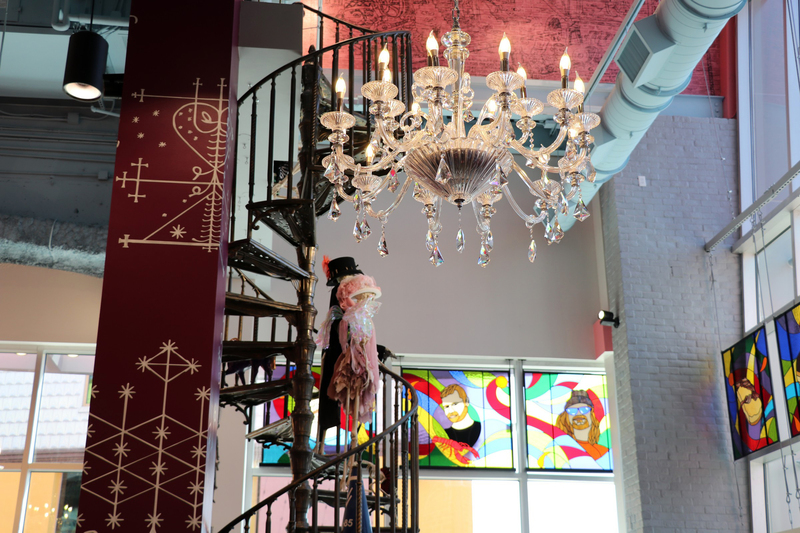 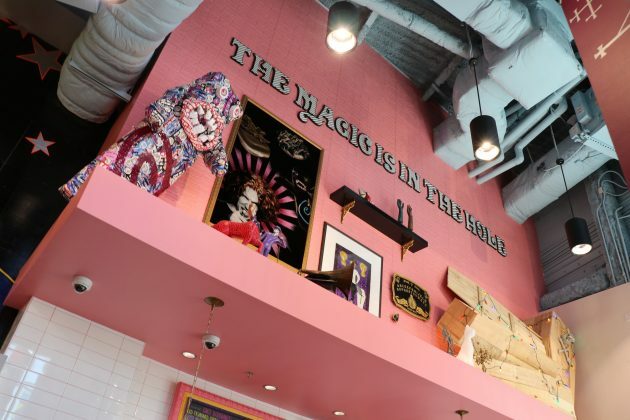 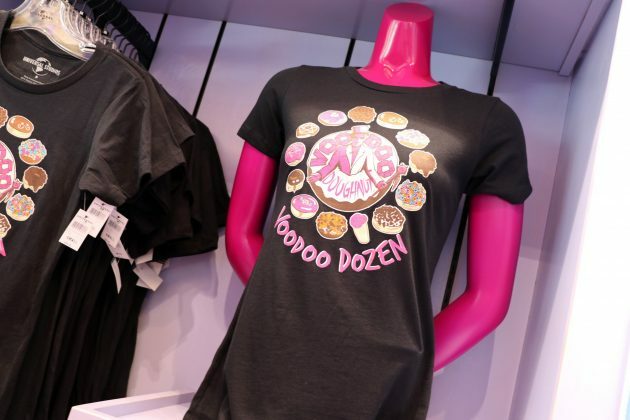 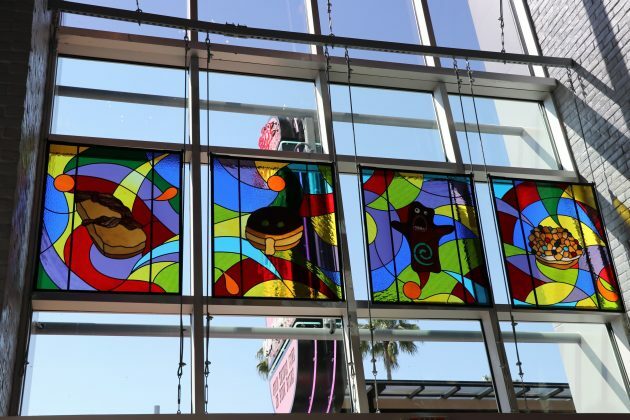 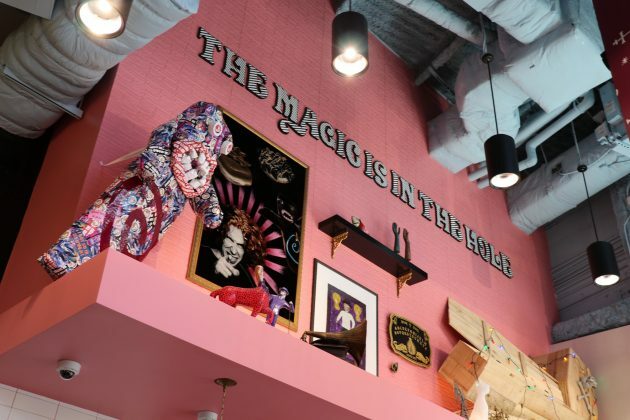 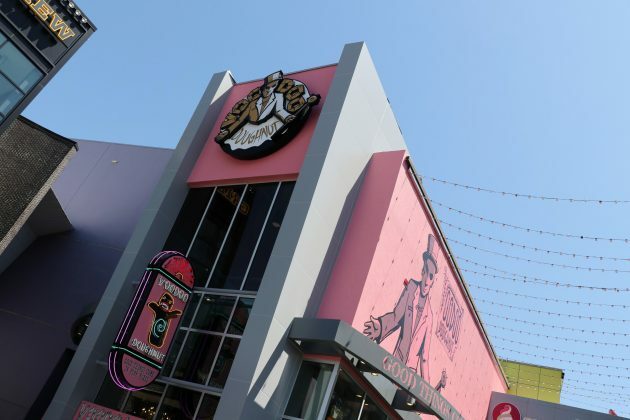 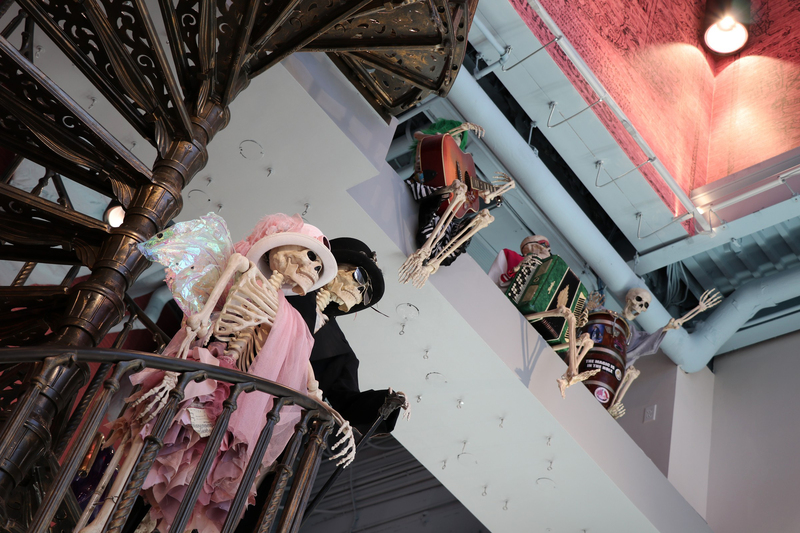 Voodoo Doughnut opened its doors for guests for the first time on Saturday, officially soft opening in Universal CityWalk. 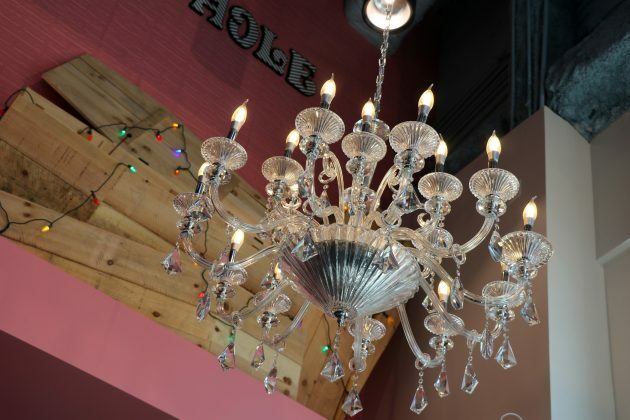 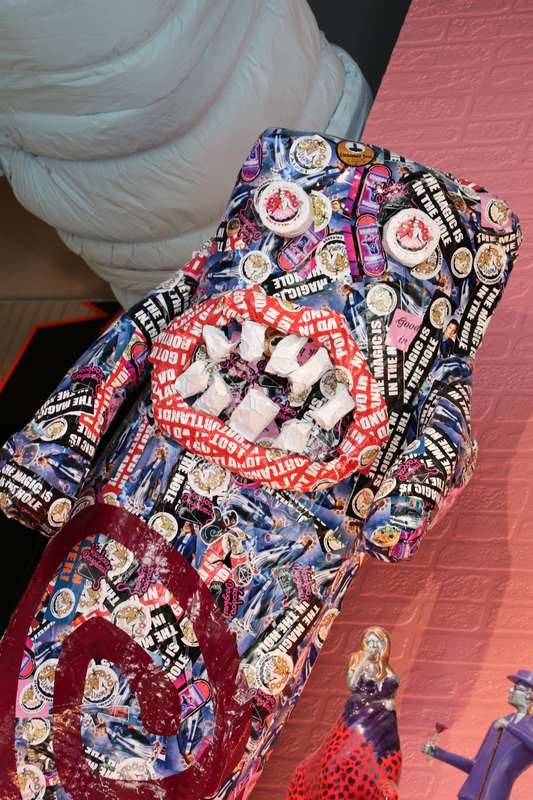 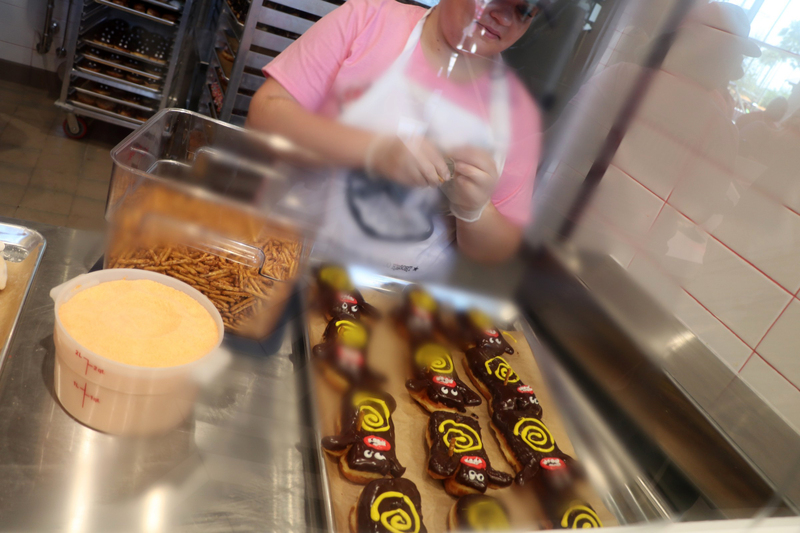 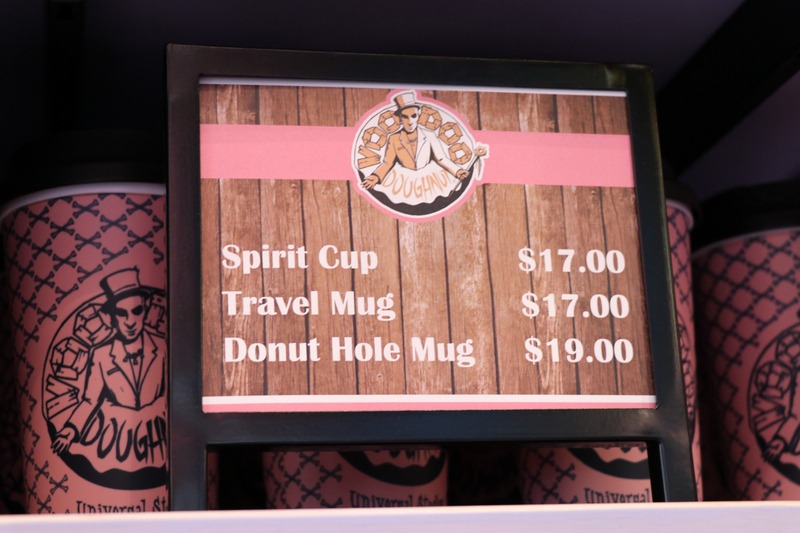 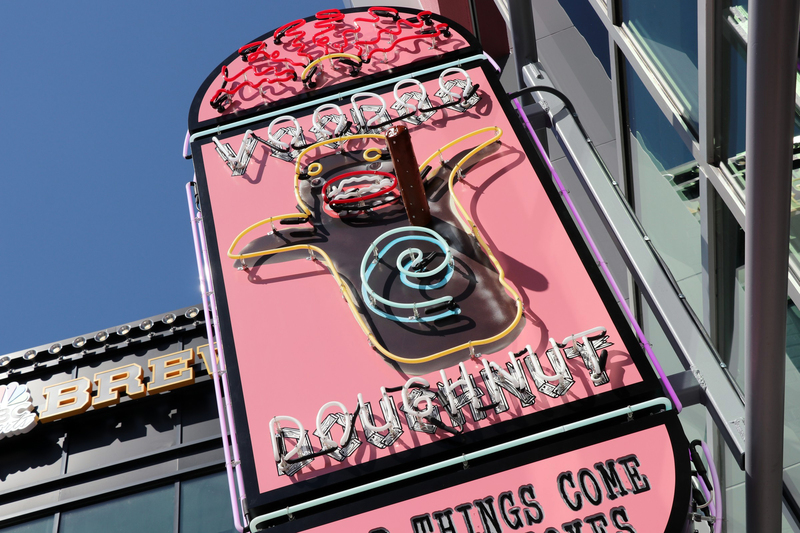 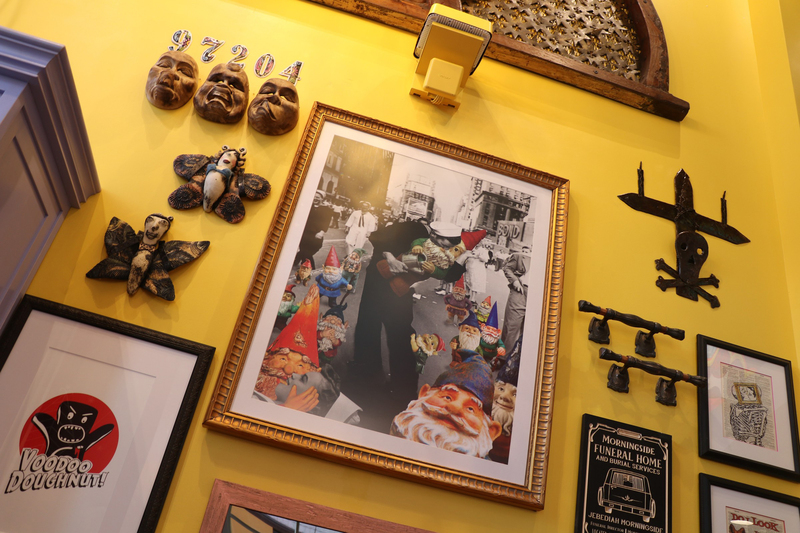 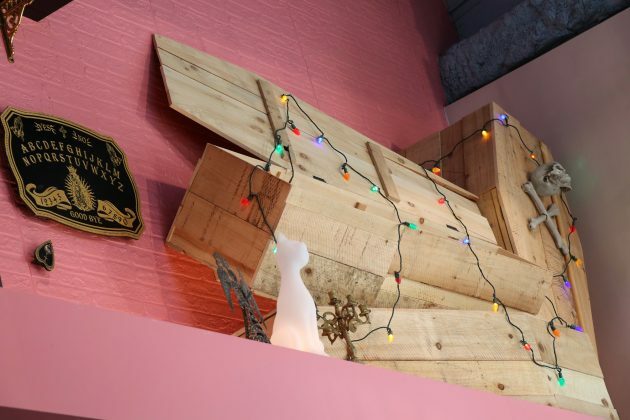 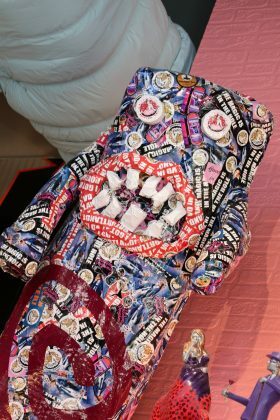 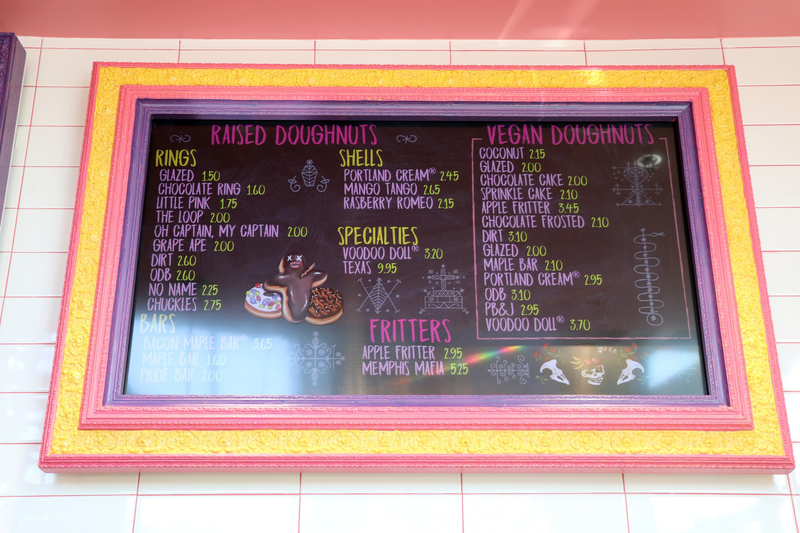 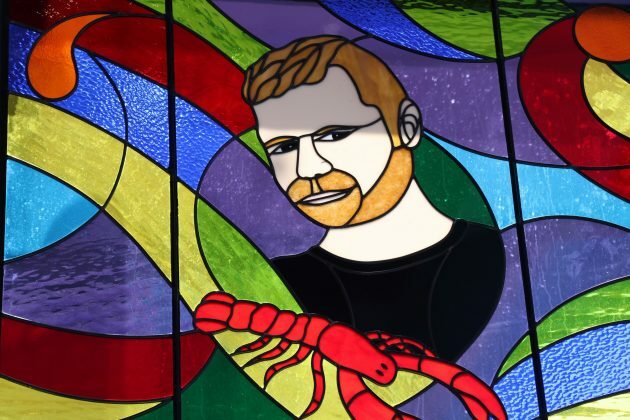 Loved for its “delightfully weird” lineup, Voodoo Doughnut features signature originals and one-of-a-kind donuts such as the the Bacon Maple Bar, Grape Ape and more. 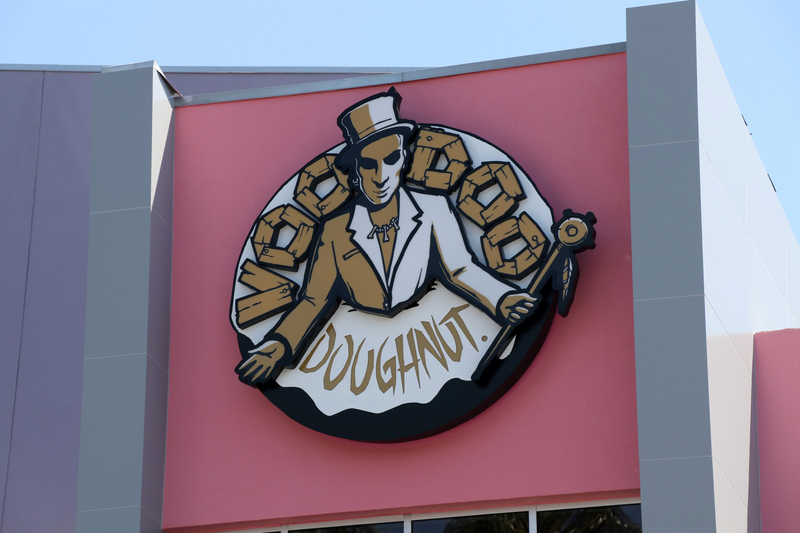 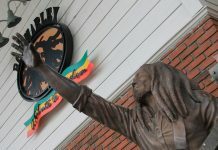 When it officially opens, it will be the first location east of the Mississippi. Single doughnuts cost between $1.50 and $3.70. Guests can also choose 1 of 3 options for a box of a dozen doughnuts, ranging from $15 to $28. 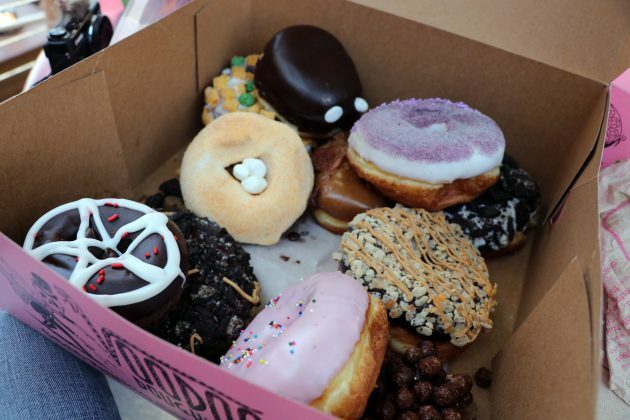 The “Classic dozen” features their standard, traditional selection. The “Fryer Flyer Dozen” features all of their premium options. 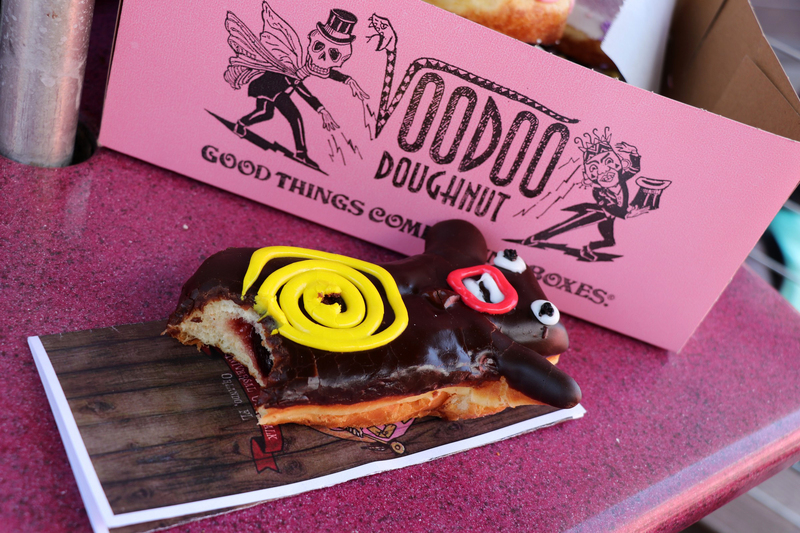 The “Voodoo Dozen” is a mix of the two. If you’re looking to go all-in, there’s a doughnut-filled wooden coffin for $139. 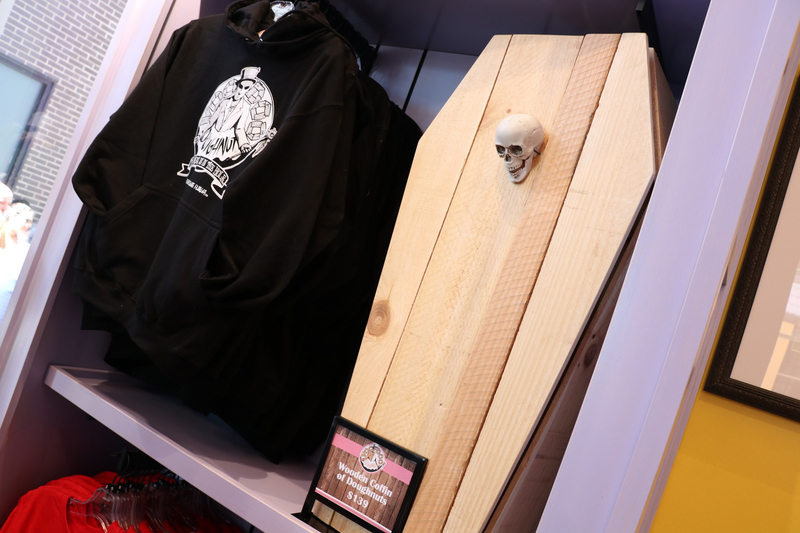 The coffin comes with 3 baker’s dozen boxes of randomly selected doughnuts. Taylor Strickland, from Orlando Informer, was the first to buy an “East Coast” coffin. 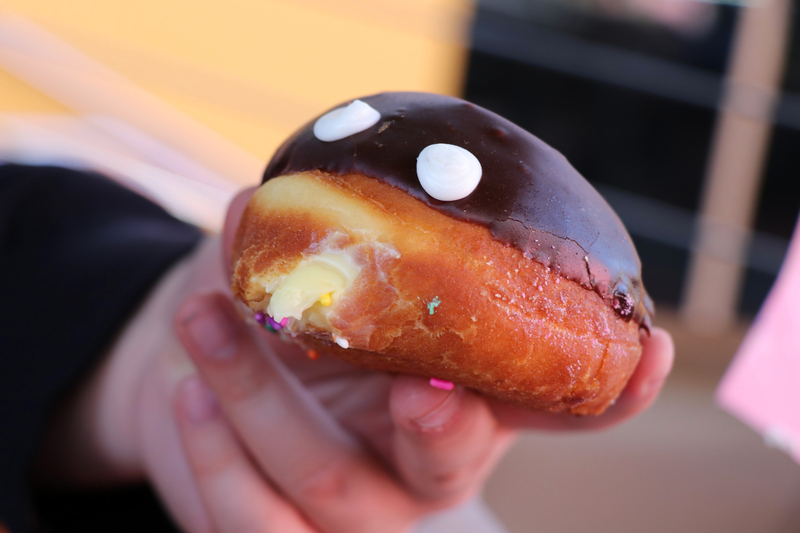 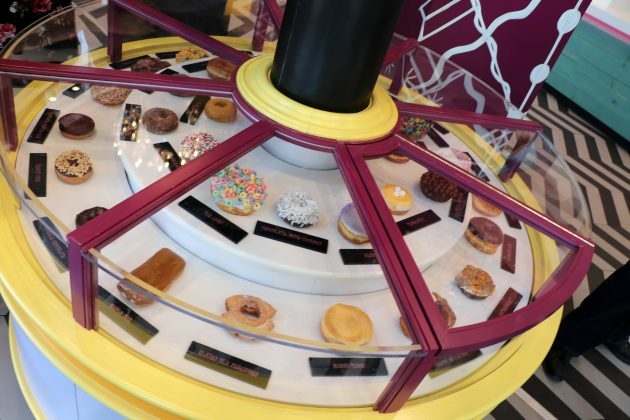 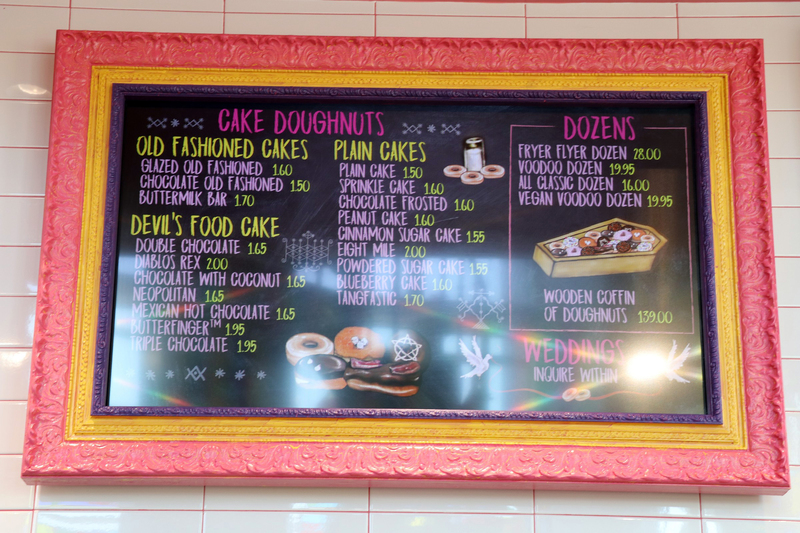 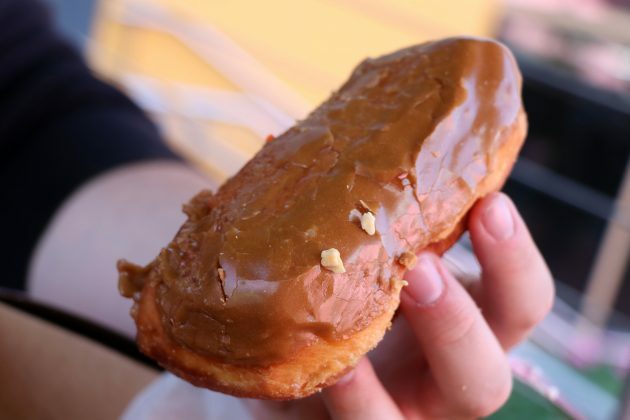 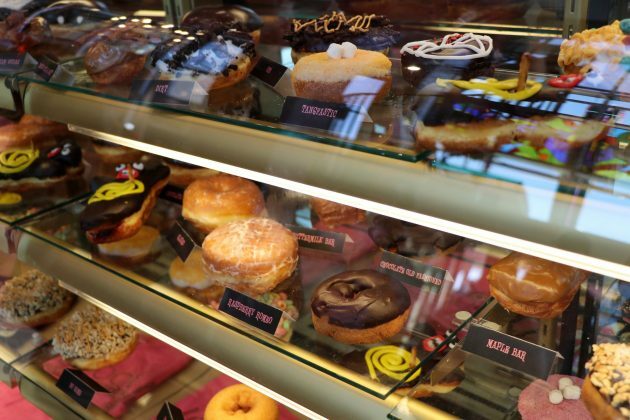 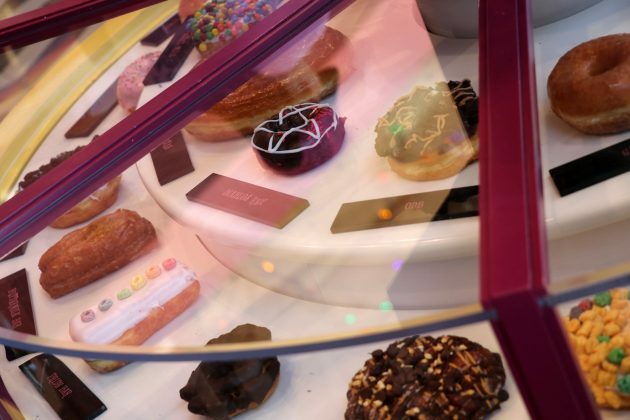 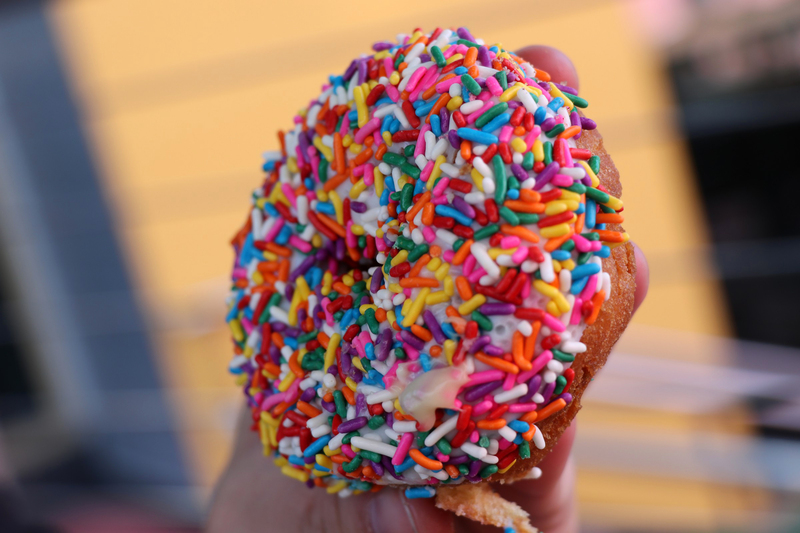 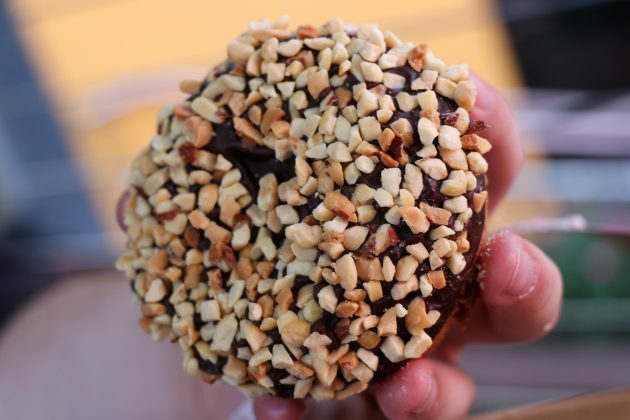 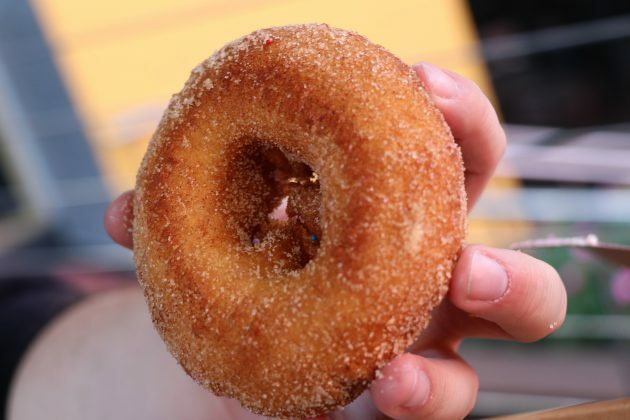 With over 50 different options to choose from, some of the highlights include their signature donut – the Voodoo Doll, which is a chocolate frosted doughnut that is filled with a raspberry jelly. 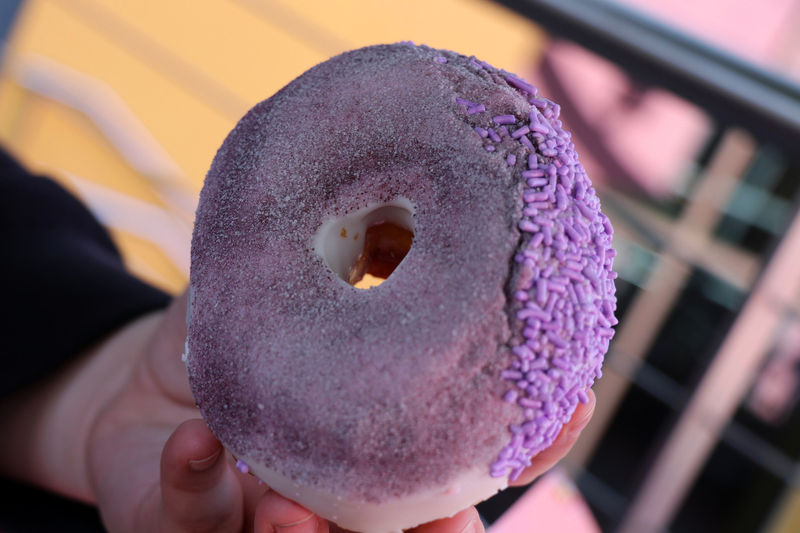 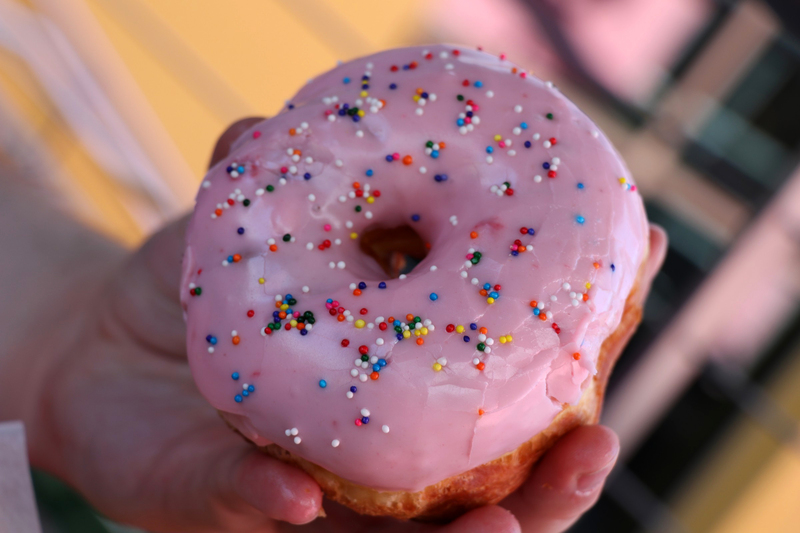 One of their unique offerings is the Grape Ape, which a vanilla frosted doughnut with grape dust and lavender sprinkles. 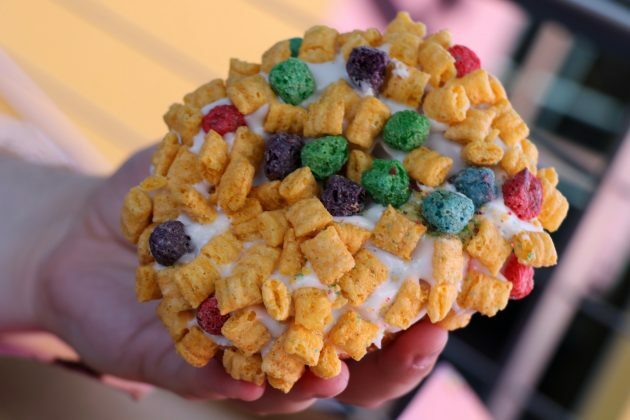 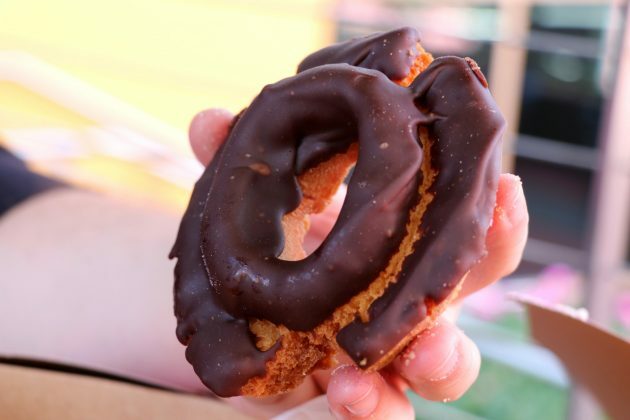 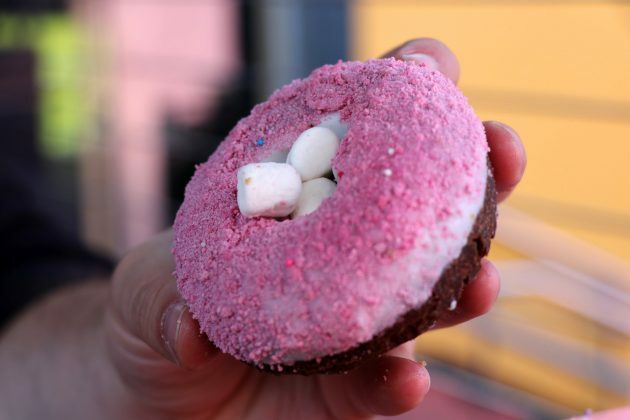 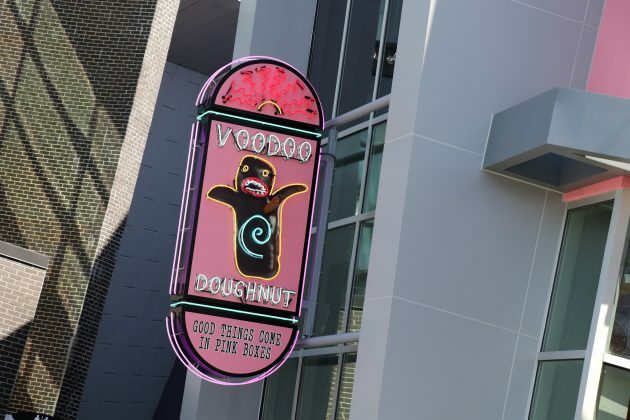 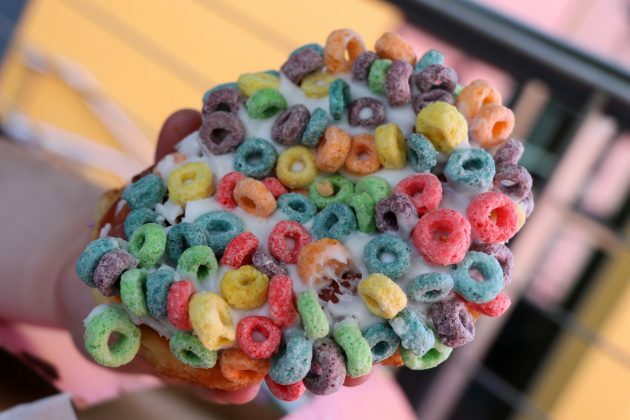 Voodoo also features several varieties of overindulging toppings on their doughnuts, including doughnuts topped with cookies, candies, and cereal – like Captain Crunch & Cocoa Puffs. 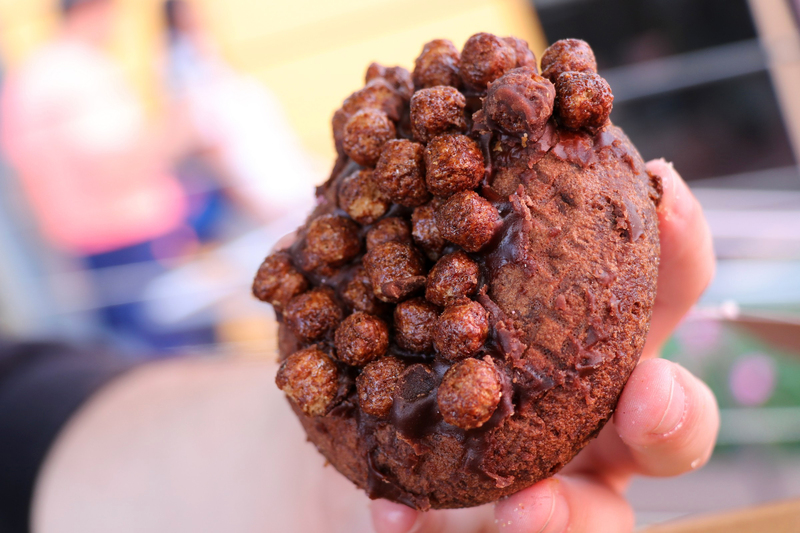 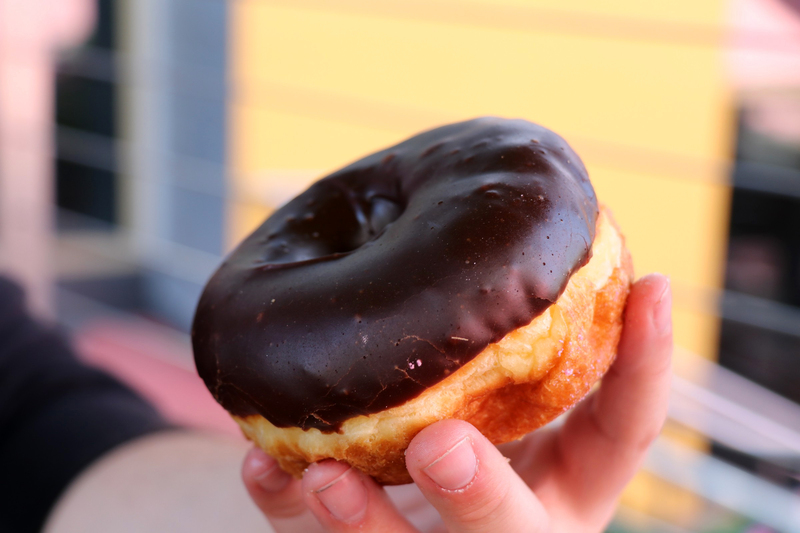 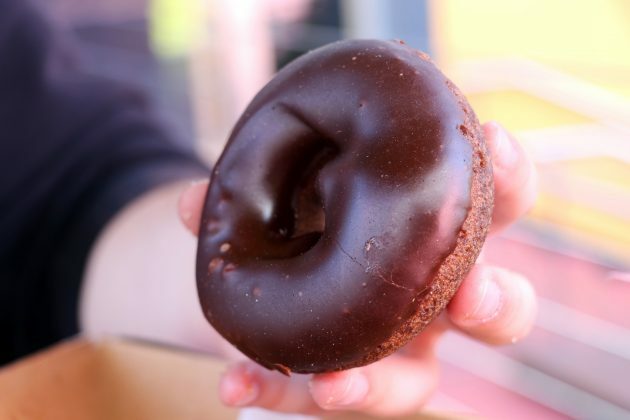 The Triple Chocolate – a Cocoa Puff-topped, chocolate frosted, chocolate doughnut. 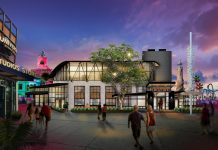 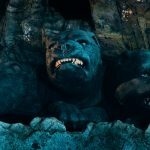 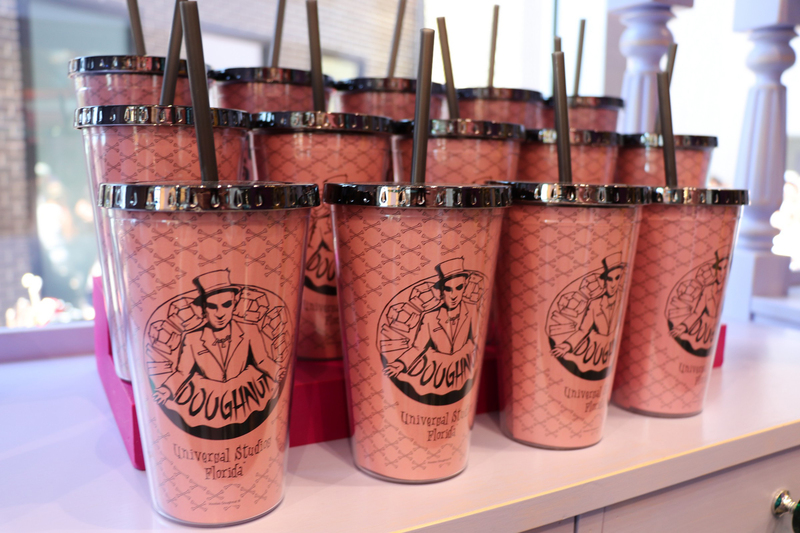 Although not available yet, Universal Orlando will be getting an exclusive doughnut soon. 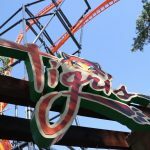 The only hint we were given is that it will be tropical. 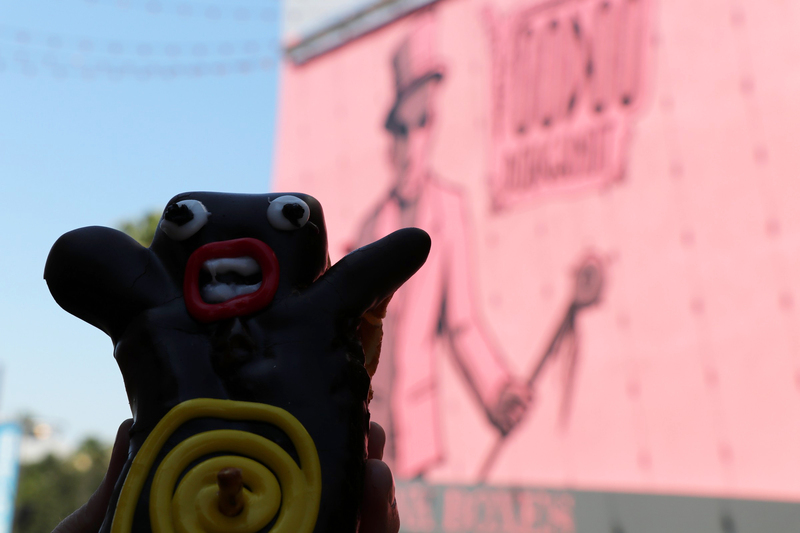 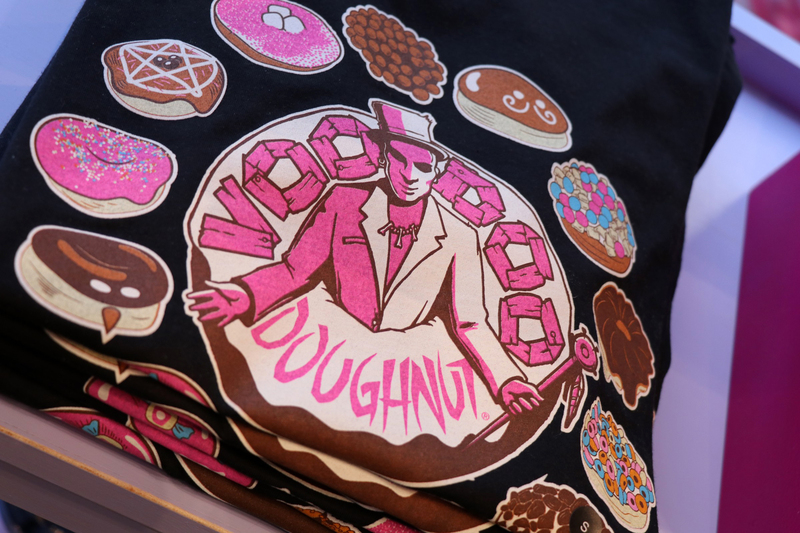 Kenneth “Cat Daddy” Pogson and Tres Shannon created Voodoo Doughnut in Portland, Oregon in 2003. 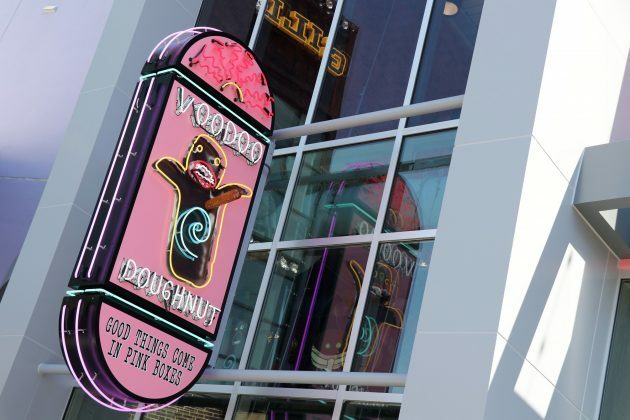 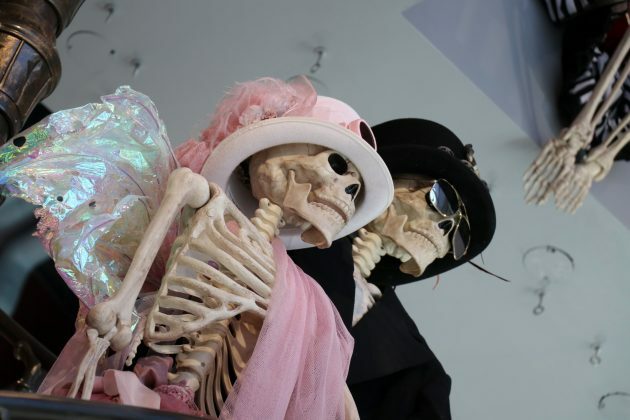 The pair had enjoyed experimenting with unique flavors to create eccentric pastries and they turned their passion into the phenomenon that is Voodoo Doughnut. 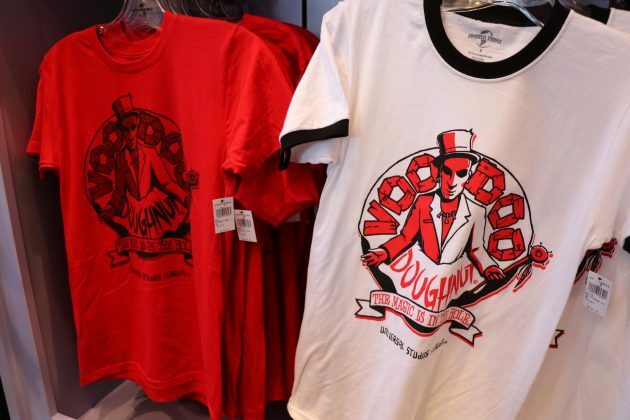 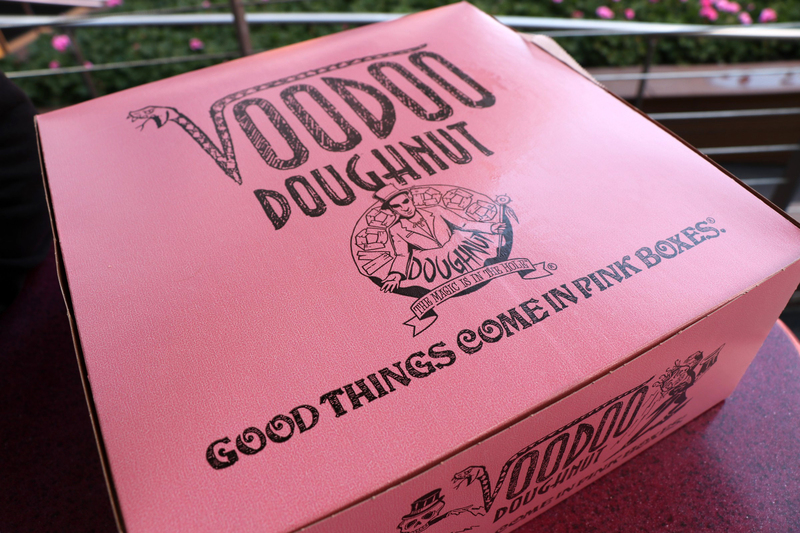 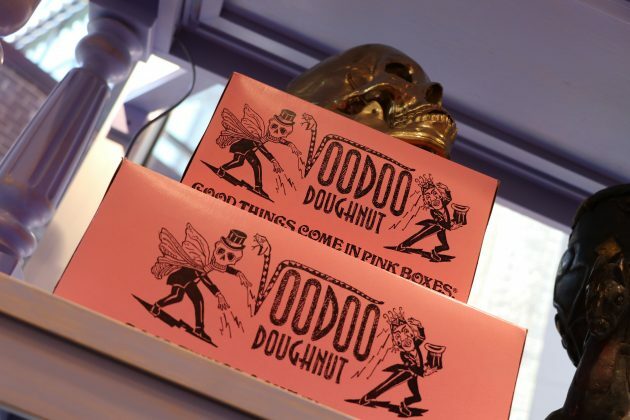 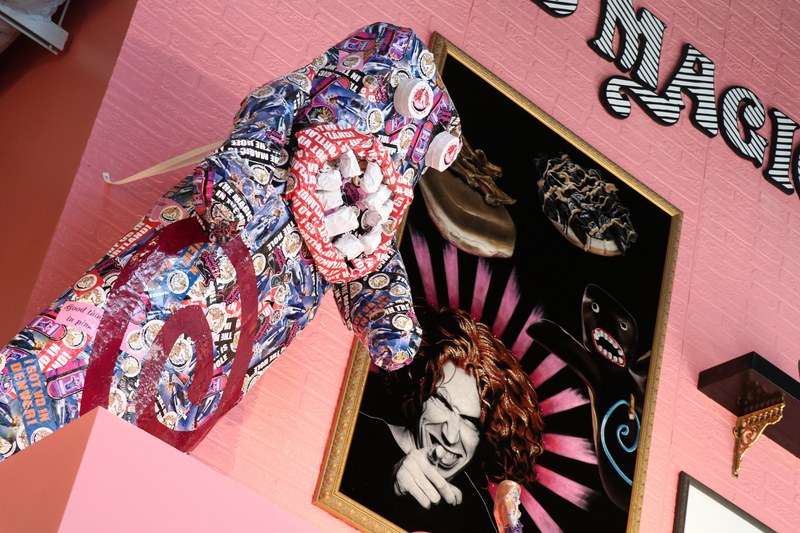 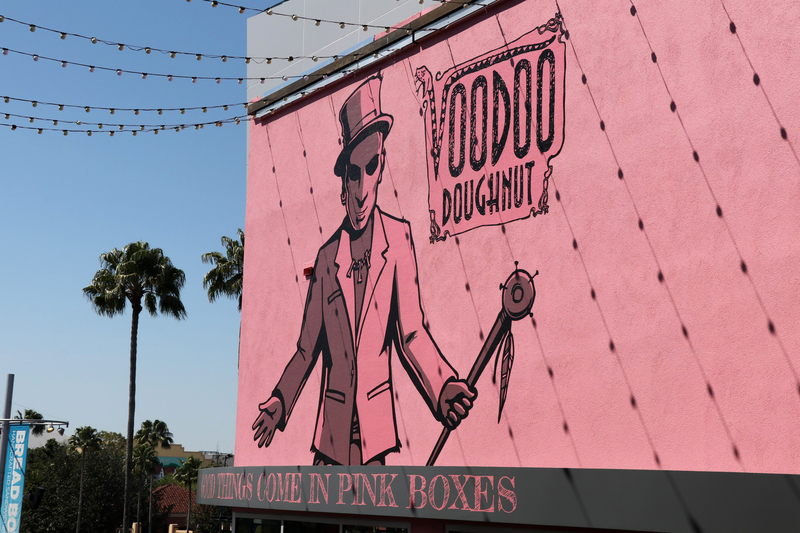 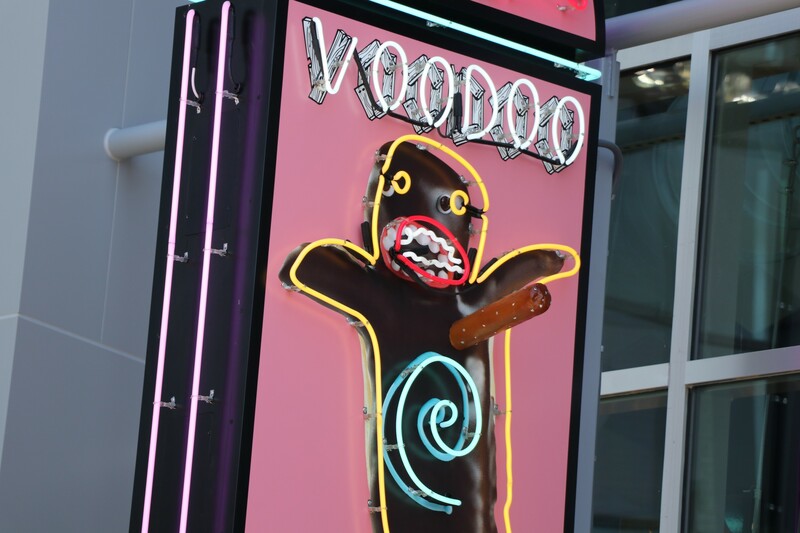 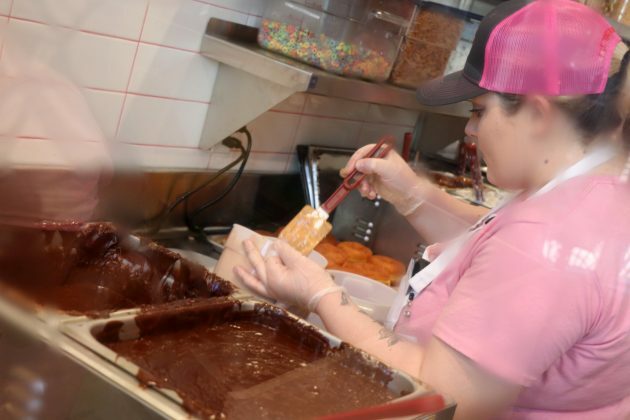 Voodoo Doughnut opened in CityWalk Hollywood last year to long lines and rave reviews. 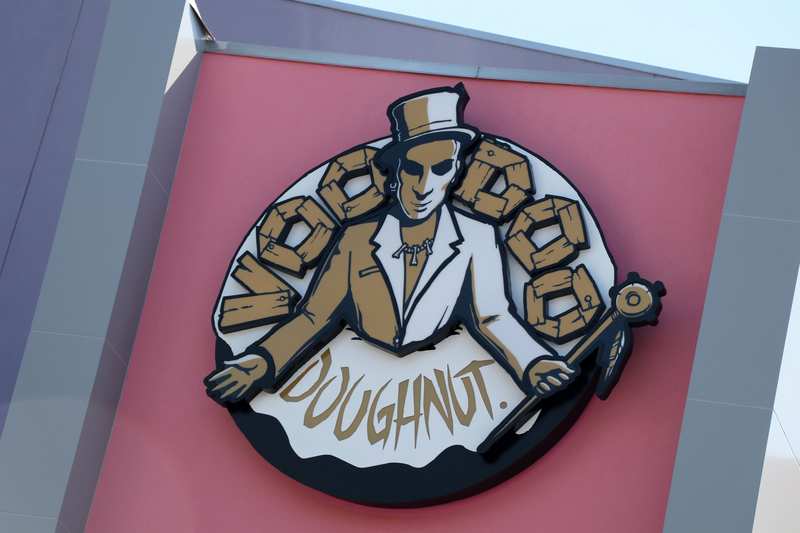 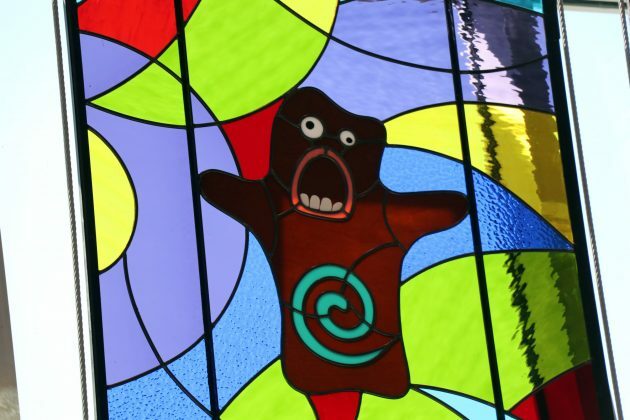 Remember, Voodoo Doughnut is under a soft opening, which is basically a preview. 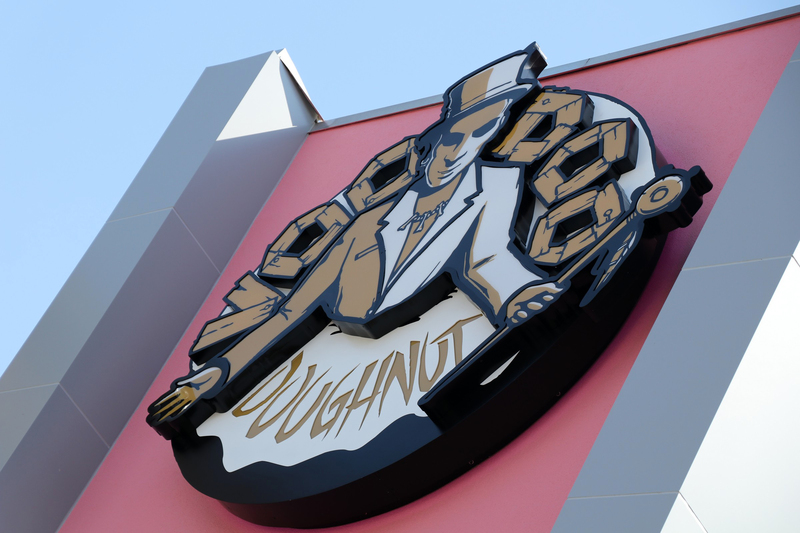 There are no set hours of operation or guarantee the location will be open until it officially grand opens. 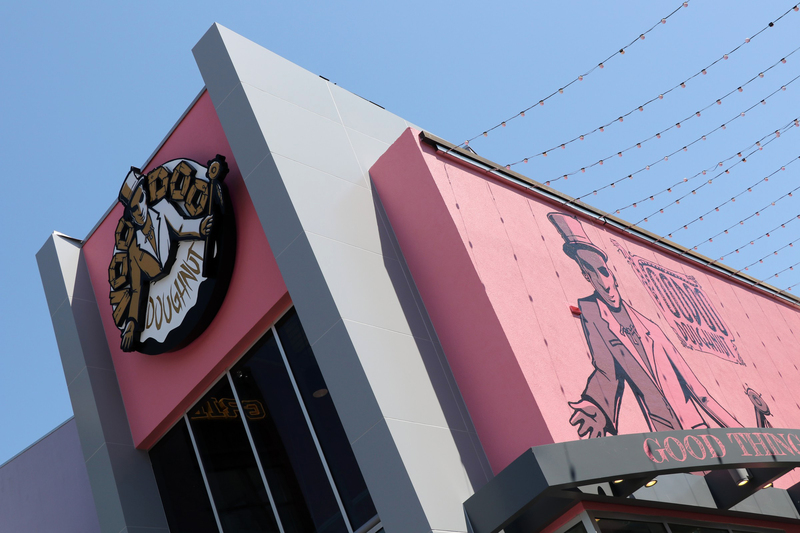 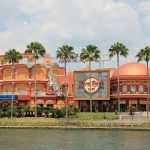 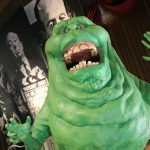 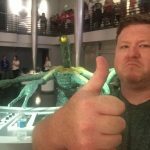 An official opening date has yet to be announced. The Triple Chocolate.- a Cocoa Puff-topped chocolate frosted chocolate doughnut.